It’s beginning to look a lot like Christmas, and nowhere more so than on Auto Trader’s social media channels. 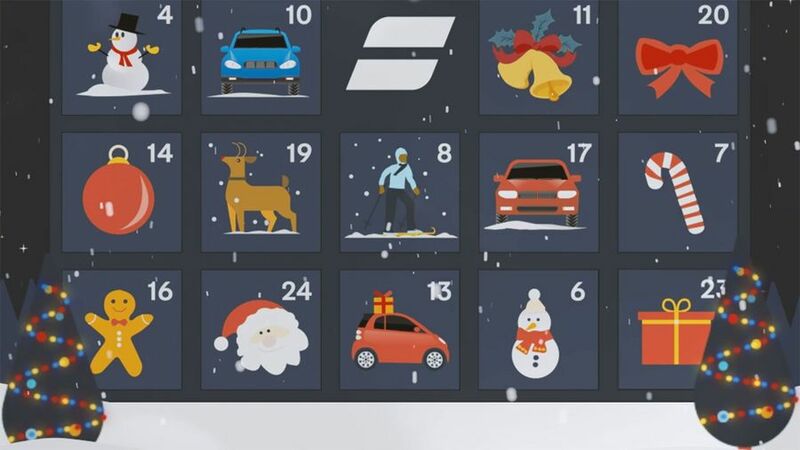 From December 1st until Christmas Eve, the Auto Trader Advent Calendar will be live, with a prize up for grabs every day. Tweeters and Instagrammers alike will be challenged to guess the make and model from a blurred image of a car, posting their answers using #AutoTraderXmas on Twitter and a comment on Instagram. 1. This Promotion is only open to residents of the United Kingdom aged 18 or over, excluding employees of the Promoter and anyone professionally connected with this Promotion. 2. No purchase necessary; however, a valid Instagram or Twitter account is required. 3. Promotion Period: Daily entries between 08.00 and 18.00 from 1st to 24th December 2018 inclusive. 5. Maximum of 1 entry via either Instagram or Twitter during the Promotion Period. 7. Red Letter Experiences are issued subject to their normal Terms & Conditions available from https://www.redletterdays.co.uk/terms. They are valid for one year from date of issue. Some height, weight and health conditions may apply. 8. Winner Selection: A winner will be randomly selected from all those correctly identifying the make and model of the car challenge each day (defined as 08.00 to 18.00 daily during the Promotion Period.) For your total confidence, the Prize Draws will be conducted as soon as practical after the end of the daily Promotion Period. 9. Winner Notification: The daily winner will be announced on the Auto Trader UK Instagram page at 19.00 each day and will also be contacted via the social media details supplied at the time of entry. In the event that a winner does not respond to the initial contact within 3 days, the Promoter reserves the right to disqualify that winner and award the prize to a reserve selected in the same manner. Reserve winners may have less time to respond. c.	promotes any political agenda. 11. The winners will be contacted within 7 days of prize acceptance to arrange delivery of the Prizes. 12. The winners agree to allow the Promoter to use their name, social media handle and county of residence to announce the winners of the Promotion and agree to take part in reasonable publicity of the Promotion. 13. The Prizes are not transferable or exchangeable and cannot be redeemed for monetary value or for any other form of compensation. If for any reason a Prize is not available, the Promoter will substitute another prize for it of equal or higher value. 14. If for any reason any aspect of this Promotion is not capable of running as planned, including where there is infection by computer virus, network failure, bugs, tampering, unauthorised intervention, fraud, dishonesty, technical failures or any cause beyond the control of the Promoter which corrupts or affects the administration, security, fairness, integrity or proper conduct of this Promotion, the Promoter reserves the right to disqualify any individual who tampers with the entry process or does not comply with these Terms & Conditions and may cancel, terminate, modify or suspend the Promotion or invalidate any affected entries. 15. The Promoter and any associated agencies and companies will not be liable for any loss (including indirect, special or consequential loss or loss of profits), expense or damage which is suffered or sustained (whether or not arising from any person’s negligence) in connection with this Promotion or accepting or using a Prize, except for any liability which cannot be excluded by law. Nothing will exclude our liability for death or personal injury as a result of our negligence. 16. Any entry must be made directly by the person entering the Promotion. Bulk entries from trade, consumer groups or third parties will not be accepted. Incomplete or illegible entries and entries which do not satisfy the requirements of these Terms & Conditions in full will be disqualified and will not be counted. 17. If an act, omission, event or circumstance occurs which is beyond the reasonable control of the Promoter and which prevents the Promoter from complying with these Terms and Conditions the Promoter will not be liable for any failure to perform or delay in performing its obligations. 1. This document has been created for a specific promotion. If used for a different promotion it could result in terms that are not fit for purpose. 2. Unauthorised copying of this document is whole or in part will constitute an infringement of copyright. 3. Changes made to the Terms and Conditions will not be legally valid unless agreed in writing by PromoVeritas. It is the responsibility of the Client to inform PromoVeritas of any such changes, as this may affect the legality, operation and delivery of the promotion.